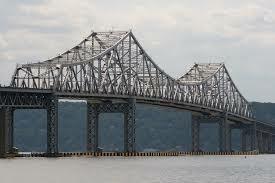 3 men died after their tugboat crashed into a barge at a Tappan Zee Bridge construction site on Saturday morning. 63 year old Paul Amon from New Jersey, 29 year old Timothy Conklin from Long Island and 56 year old Harry Hernandez from Staten Island were the 3 crew members of the tugboat “Specialist” that sank Saturday morning after crashing into a stationary construction barge belonging to Tappan Zee Constructors . The rescuers were able to find the bodies of Amon and Conklin. Searches to find Hernandez who is presumed dead were suspended sunday night according to The Associated Press. The accident happened Saturday morning. The “Specialist” was one of three tugboats that were pushing a crane barge from Albany to New Jersey. The “Specialist” was located at the right of the barge while the second tugboat was on the left and the third one in the back. As they arrived at the Tappan Zee Bridge construction site, the “Specialist” hit a stationary construction barge. Before the accident happened, the crew sent a radio message saying “”We are too close. We have to move left,” but it was too late. The tugboat sank 40 feet within minutes with the 3 men on board. The tugboat also leaked into the Hudson some of the 5000 gallons of fuel that were on board at the time of the accident.